Artist Ruth Schloss, (b.Nuremberg 1922) will go down in local history for her images of social protest. But she will probably not be remembered for the portraits she drew or painted at the start of her career. Or, those she produced in the last 20 years, until physical frailty obliged her to put pen and brush aside. Yet it is these two sets of work, the early and the late, brought together by curator Irit Levin, that form the subject of an exhibition of unusual interest. In the smaller of two galleries, small format works from the late 1940s and ’50s trace the evolution of Schloss’ unique graphic line. Drawing rather than painting would always remain her forte. 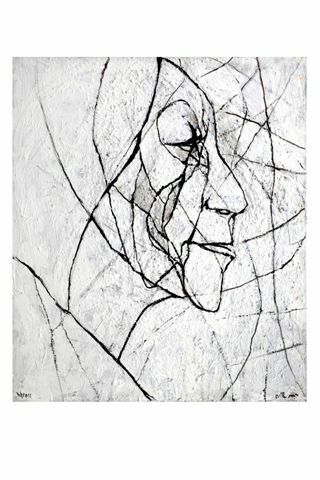 This ‘line’ first observed as sure but soft in a portrait of the artist David Hendler, bursts into life with a formidable black and white portrait of her mother, Dina Schloss. This lady, together with her husband and three daughters, was once part of Nuremberg’s prosperous Jewish community, the onset of the Nazi era bringing about their forced departure from the city. The family finally left Germany in 1937 to become farmers in Eretz Israel. Ruth Schloss was then 15 years of age. A portrait of a man (an unemployed workman?) dating from the mid 1950s is the only picture in this gallery to link up with the socially-engaged topics that would occupy Schloss’ attention totally for many years. 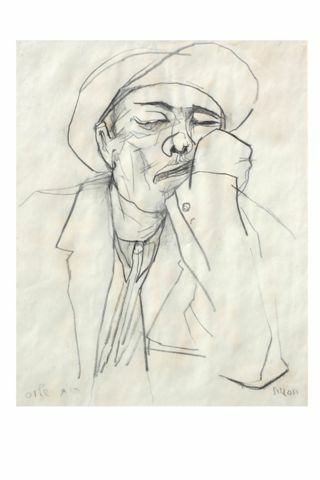 Through thousands of paintings, drawings, posters and illustrations, she would document the plight of new immigrants in the transit camps of the late 1940s and early ’50s and the suffering of the unemployed and disadvantaged. Schloss was also the first Israeli artist who dared to highlight the traumas of war. It was the loss of lives, Israeli and Arab, the suffering and devastation of property, that she chose to document. A graduate of Bezalel (where she studied applied graphics), Schloss became a member of a Hashomer Hatzair (Socialist-Zionist) kibbutz. But in 1953 she and her husband were expelled for their political views, and joined Maki, the Communist party of Israel. Already, her name was identified with Social Realist painting, a style which was fast going out of fashion in the 1950s to be replaced by abstraction. But undeterred, almost alone amongst Israeli painters, she remained faithful to this style. Consequently, her art, once very popular, was pushed to the sidelines. On view is Against the Stream, a must-see video film by Peter Dudzig. This hommage to Schloss and her life in art was shown in an exhibition of her work held in 2008 in Nuremberg, the city of her birth. As illustrated here, throughout her career she has employed two quite different approaches in her art: politicized paintings that from the 1980s incorporated press photos; and stark line drawings of distressed individuals, mainly women and children. 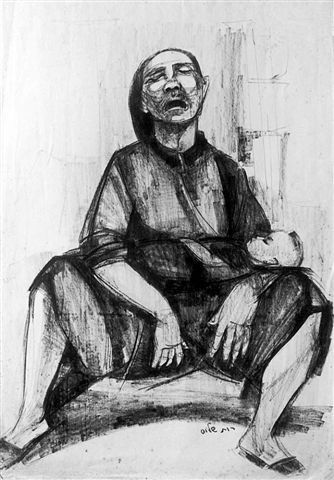 One fine example of the latter group, (not in this show) is her portrayal of a woman with a baby on her lap, head thrown back in despair or exhaustion. In its style and subject matter, this image, and others similar to it, has invited comparison with a well known drawing, Mother and Dead Child (1903) by German expressionist artist Kathe Kollwitz. The large format portraits of elderly people that Schloss produced in the last 20 years touch one’s heart for their compassion and understanding. 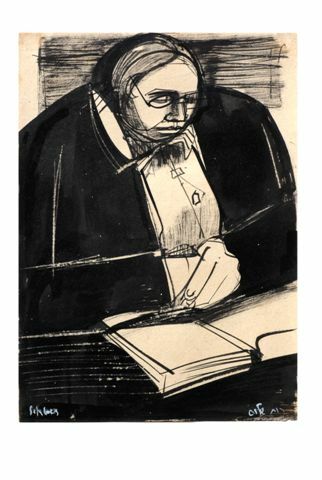 Sited on the walls of the main gallery, these paintings in charcoal or acrylic, on paper or canvas, were executed when Schloss herself was in her seventies, or even older. 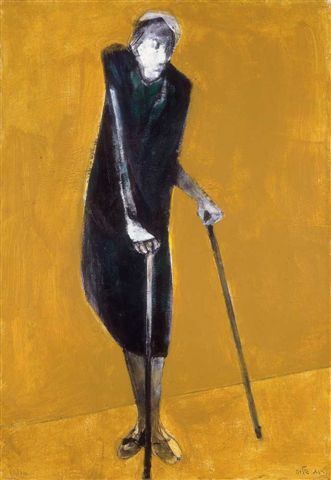 In my opinion, these images have never been surpassed by any other Israeli artist for their insights into the subject of old age. Visits to an elderly relative at a retirement home in the late 1990s were the starting point for the series. Some drawings were based on photos, most were a product of Schloss’ memory and imagination. The painting of an old woman in a dark green shift with paper thin arms resting on crutches is especially revealing. It succeeds in conveying not only the difficulty that this elderly person has in standing and walking, but also her determination to try all the same. This is one of a very few paintings selected for this exhibition which has a colored backdrop; the mustard-yellow chosen here serving to recall Schloss life-long penchant for strident, unrealistic hues. However, most of her portraits of old people are set against white or neutral surfaces. The final work in this series was executed when Schloss was 86 years of age. It is a remarkable achievement. Here, spread over a pale, knobbled surface is a cobweb of lines with the face of an elderly woman, eyes half closed, entangled within. The effect given is of a woman living in a twilight world of her own. This then, is the unique graphic line of Ruth Schloss, now fine but still firm, as she applied it for the last time, and in doing so created a small masterwork. Artists House, 9 Alharizi St., Tel Aviv. Till March 17th.